Most effective minoxidil-based hair-growth spray lotion The world’s most effective topical hair-growth treatment, in a spray lotion for easy application with thinning hair, Spectral.DNC is an advanced formula that addresses all of the known factors in hair loss. In addition to minoxidil, Spectral.DNC includes other powerful hair-regrowth agents such as Aminexil®, adenosine, procyanidins B-2 and C-1, and T-flavanone, as well as the auxiliary agents retinol, copper peptides, and a rich vitamin-and-mineral complex. Active ingredients are delivered in a technologically advanced vehicle, tiny microspheres called Nanosomes. Unlike formulas that use regular minoxidil, an oil-soluble molecule, and feel greasy and irritating, Spectral.DNC is created with minoxidil sulfate, a premium form. Because it is water soluble, it does not require a high concentration of propylene glycol or alcohol. While mixing, the sulfate ion separates, leaving highly pure minoxidil. Spectral.DNC works faster and more effectively than Rogaine® because it performs on both the vertex of the head and the frontal hairline. 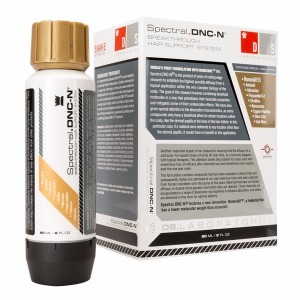 Spectral.DNC offers the best chance of growing normally thick and healthy hair and works for people who previously did not respond to Rogaine treatment. Revita is the most efficient hair-growth-stimulating shampoo available in the market and is the final result of DS Laboratories’ efforts in cutting-edge research. Revita is a powerful combination of precious materials specially designed to maintain scalp vitality and act on follicular dysfunction to achieve best results in short periods of time. This formulation is developed completely without the use of sodium lauryl sulfate and sodium laureth sulfate, low-cost detergents commonly used in shampoos and cleansers that are linked to skin irritation, drying, and hair loss. Revita includes the following top-level ingredients at high concentrations, chosen for their properties and obtained using a chemical-free extraction process to preserve maximum efficacy: caffeine, copper peptides, spin traps, ketoconazole, rooibos, methylsulfonylmethane (MSM), apple polyphenol (procyanidins B-2 and C-1), carnitine tartrate, ornithine, taurine, cysteine, emu oil, and biotin. By combining an antioxidant effect, anti-dihydrotestosterone properties, powerful hydrating molecules, hair-growth stimulants, and structural amino acids, Revita brings you the most effective hair-growth-stimulating shampoo available, with absolutely no equivalent in the market. Revita.COR delivers state-of-the-science hair-regrowth technology that builds on the legendary success of Revita shampoo. This conditioner establishes a new benchmark for the comprehensive synthesis of hair-regrowth compounds. Unlike common conditioners, Revita.COR contains powerful ingredients known to stimulate hair growth. These active ingredients come encapsulated in hydrophobic, bio-adhesive, cationically charged lipospheres. This next-generation delivery system adheres to the scalp tenaciously, keeping active ingredients attached and working hard for 12 hours or longer, to achieve maximum hair-growth effect even while sweating or swimming. Ultra-premium compounds in Revita.COR, each evaluated and proven in clinical trials, provide significant benefits against follicular dysfunction. 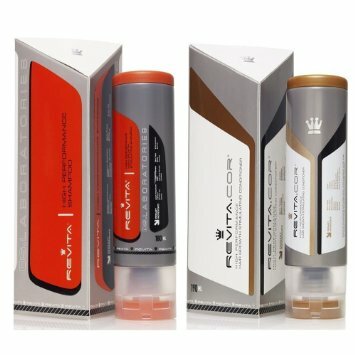 Unique among conditioners, Revita.COR employs plant-based stem cells, which exhibit much of the same plasticity as human stem cells, plus a powerful inhibitor of 5α-dihydrotestosterone, the hormone that triggers male pattern baldness.